If you’ve ever walked with trekking poles you will very quickly notice the difference in how easy it is to hike. They will be able to give you added stability while also being able to take the weight off your joints. They can vary a lot in quality however, and therefore it’s important to find the best trekking poles. Finding the best hiking poles can be difficult as there are a lot of different features which are important. You want to make sure that they are the right weight and length but other aspects can make a big difference too such as shock absorption, adjustability and material. Here we will explore all those key features and why they are important. We have also completed trekking poles reviews on the best products on the market to show you what’s out there. Once you have read through this guide, you’ll have all the information you need to choose the perfect trekking pole for you. 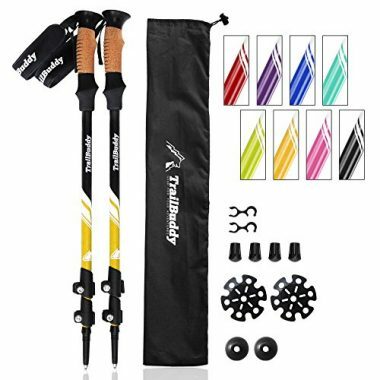 TrailBuddy have produced one of the top rated hiking poles on the market which has received a long list of great reviews from those who have used them for a long time. They are made from aluminum which is going to be able to give you a very high degree of strength. The aluminum on this model is particularly light too which is going to make a difference when you are lifting them thousands of times. It’s height adjustable from 25.5 inches to 54 inches which will give you a large range and can easily be adjusted while wearing gloves. They feature cork handles which are going to be able to give you a large amount of comfort and cushioning as the cork will mold to the shape of your hand. These poles are available in a wide variety of different colors which will be able to give you an individual style. These are another pair of walking sticks which are available in a nice range of colors which will help you to add a touch of your own personality when you are out there hiking. These walking poles are highly rated and you can be confident that you are getting a quality product. They have an impressive level of shock absorption which will be able to ease the pressure on your joints for a more comfortable hike. They have long EVA foam handles which are going to absorb moisture from sweaty hands while giving you all the comfort that you need. 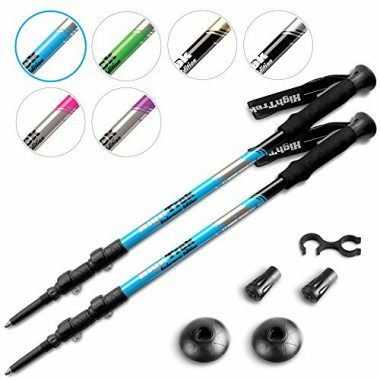 These lightweight trekking poles are made from high quality aluminum which not only gives you the lightest trekking pole but they also are very strong too. They extend from 26 inches to 53 inches which is going to be able to give you all the adjustability that you need. 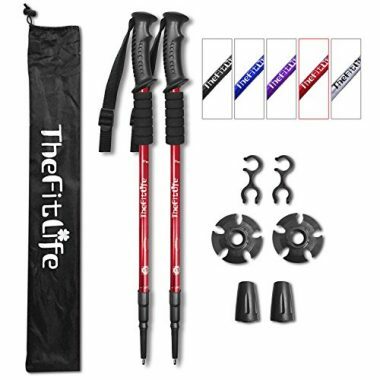 These hiking poles are very comfortable to hold with their ergonomically designed grips which will be able to stop your hands from slipping through sweat and a ribbed too which will be able to give you an added level of grip, the wrist straps will also give you extra security. They will be able to extend from 25.5 inches to 52 inches which will be able to give you all the extendibility that you will need. The poles also have an anti-shock spring which will make the hike as comfortable as possible and avoid any pain. High quality aluminum is used for the poles which will make them both lightweight and durable with each pole weighing just 12.4 ounces. The product also comes with two spare tips which are going to be able to last you for a very long time. 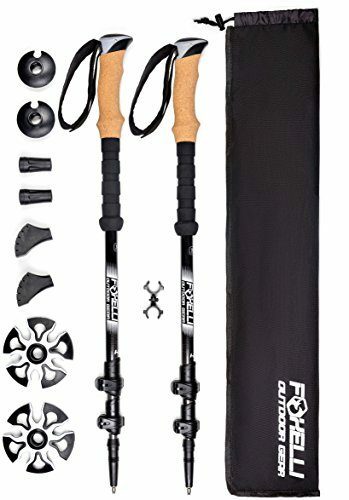 Foxelli have been able to produce these brilliant hiking poles which are one of the most highly rated products that you can possibly get. They have anti-slip cork grips which are going to be able to take the moisture away from your hand for a more comfortable hike. They also have air ventilated wrist straps which are padded for extra comfort and that extra comfort extends to the pole too as they are made from shock absorbent carbon fiber. It has an extended EVA foam sleeve which helps you to easily change hand position on difficult terrain. The quick lock technology will help you to extend the pole in a very short space of time and can be done with cold or gloved hands. It also features a heavy-duty carbide tip which will be highly durable while giving you a great level of traction. Cascade Mountain Tech have made trekking poles which you can actually buy with either an EVA handle or a cork handle depending on your preference. They are made from carbon fiber which is going to be able to give you a great level of durability for a very low weight. It has all the extendibility that you need and is able to be done via their quick lock system which will allow you to instantly change the length of the pole. There are a few different designs available and these poles will look great when you are outdoors. One of the unique features of this product is that the poles come with a variety of different tips available as they have snow baskets, boots and small rubber feet which mean that this is a pole which can be used in all conditions. High Trek are a company who have produced their poles in a range of great colors which all look great and will give you a sense of style when you are out there on the trail. They are also very easy to use and have lever locks for a very quick adjustment if required. That adjustment has a very large range which will suit everyone and they feature comfortable handle grips which are made from EVA. They will provide cushioning to your hands while making sure that they don’t ever slip. The tips of the poles come in tungsten but there are also a great range of different tip attachments that are available, which will give you a great amount of traction on any ground that you are covering. The product also comes with a one year warranty so you can be assured of its quality. These trekking poles aren’t very extendable and instead you will be able to choose the size that best fits you. The reason for that is due to the fact that they are foldable which means that you can easily store them away when they are not required. The material is made of very strong aluminum which is going to be able to give you a high amount of durability. They aren’t the lightest poles that are out on the market but they are among the most durable and it depends what is more important to you. 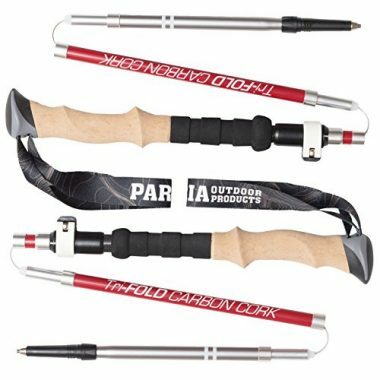 Cork handles are able to give you a high level of grip while keeping your hands dry and these grips from High Stream Gear are going to give you a high level of comfort. The product also comes with different tip ends for various conditions too. 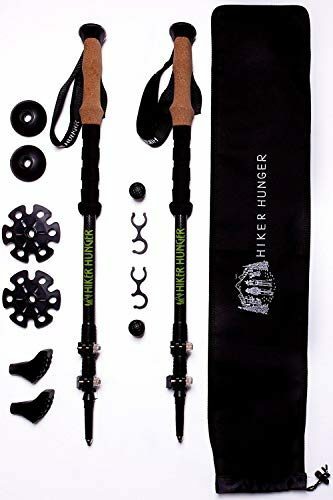 Hiker Hunger are another company who have produced a product which comes with a variety of different tips in order to ensure that you are able to hike in all conditions while still getting the most out of your trekking poles. They are very light as they are just 7.6 ounces each which is due to the fact that they are made out of carbon fiber. That carbon fiber will also be able to give the poles a natural level of shock resistance as well as a high amount of durability. The handle has a cork grip on the top for comfort and moisture wicking but also has an EVA handle below for when you are climbing up tough terrain. The hand straps are adjustable and the tungsten tips are going to be able to give you a high level of durability. If you are looking for trekking pole which are able to be folded away then this could be the perfect product for you as you are able to fold it down into three smaller pieces which will give a length of 15 inches to be easily stored away. The poles have an incredibly high level of durability as they are made from carbon fiber shafts but also have aluminum alloy connectors as well as a tungsten tip. Assembly of the poles is extremely simple and you would be able to have them up and down very quickly. They have a comfortable cork handle which will be able to absorb sweat and the poles have a low weight, especially considering their durability and the fact that you can fold them down. A limited lifetime warranty is offered on this quality product. This is another quality product from Cascade Mountain Tech but this is made out of aluminum which is aircraft grade and will be able to give you a high amount of durability and they won’t have a lot of weight in them either. They have a quick lock feature and have all the extendibility that you will need from a trekking pole. This is another product which comes with a number of different tip ends to ensure that you have the right level of traction whether you are hiking in the dry, mud or snow. This is another product which uses a cork grip for that comfort and sweat absorption with adjustable wrist straps to ensure that they stay attached to you at all times. They come in a useful carry case too which is great for transport and storage. The adjustability of poles is very important for a couple of different reasons with the first one simply being that it will allow you to be able to get the perfect height for you. This is important and can also be a personal preference and if you don’t know your perfect length already, then it can be difficult to get a fixed size trekking pole. Being adjustable will enable to you find the perfect height for you where you are able to get in a nice rhythm and take the weight off your joints. Adjustability will allow you to also share the poles or use anyone else’s for whatever reason. It can make them a lot more dynamic and easier to use. It could be though that you know exactly the size that you want and would prefer the feel of a fixed pole or there might be other features which you value as more important. Adjustability is also crucial in being able to climb and descend in the most comfortable way. If you are climbing uphill, for example, then the ground in front of you is obviously going to be higher which means that the poles would need to be shorter. The opposite is required for a downhill hike and having a quickly adjustable pole can be very useful. When it comes to the materials that make up the shaft, they need to excel in two key aspects as they need to be both lightweight and durable so that they are easy to pick up and won’t break easily. In the world of trekking poles that means that it comes down to one of two materials as they will either be made of aluminum or carbon fiber. Aluminum – One of the great things about aluminum and the reason that you find it in so many products is that it is a cheap material which has a lot of great qualities. Due to this, these types of shafts are going to be a cheaper pole than their carbon fiber counterparts. You may think then that carbon fiber would be able to hold all the advantages but this isn’t true. Aluminum shafts will actually be more durable and therefore there is less chance of it breaking. The caveat to that though is that they are heavier but this will only be by a few extra ounces. One of the key characteristics of their durability is that they would bend under too much weight and this could be bent back if it wasn’t too bad, carbon fiber instead would just snap. If you are going to be doing long hikes on rough terrain, aluminum might be the best way to go. Carbon Fiber – Carbon fiber then is going to be the more expensive option when it comes to trekking poles but what do you get for that extra expense? As we mentioned in the previous section, carbon fiber models will be lighter which makes them extremely easy to pick up without fatigue. While not having the same durability, carbon fiber is still going to be a highly durable product and not one that is going to break very easily at all. That light weight, as well as the good amount of durability that it does have, makes it a very attractive option to many. There is another factor which makes carbon fiber a more desirable product too and that is that it has a natural level of shock absorption in it due to the slight flex in the materials. This will help take the weight off your joints and could make for a more comfortable hike. When it comes to the grip, you first want to ensure that it is well designed enough in order to be able to cope with the grip of your hand. It needs to be ergonomically designed in order to give you all-day comfort as there is little point in having the best grip material if the handle is an uncomfortable shape. Once you have checked that though, then it’s time to make a choice between whether you want to have a foam grip, a cork grip or a rubber grip. All three of them have their advantages with plenty of companies offering the choice between one grip or another. Cork – If you have never held a cork handle before then it might be seen as a curious choice to some who are much more used to seeing rubber or foam handles on most products. It is seen by many though as the best material when it comes to trekking pole handles. The reason for that is due to the fact that it gives you a very high level of comfort when you are holding it and it will actually mold to your hand over time which will further increase the comfort levels of the handle, making it a very popular choice. Added to that is the fact that it is also highly durable which is partly due to the fact that it doesn’t chafe which means there is very little wear on the product and it should last for years. A cork handle will also look great too which might be a key feature for many. Rubber – In terms of handles, rubber has long been used on many different products due to the high level of grip that they have as well as being soft enough to provide a decent level of comfort, rubber is found on a lot of standard and lower range poles. In colder weather it becomes more of an attractive solution as it will be able to insulate better than the other two options and it is also not very expensive either, making it a popular choice in terms of the cheaper range of trekking poles. In hot weather, rubber doesn’t perform as well. They aren’t quite as comfortable as the other two option and they also become more slippery when wet. It’s also a material that can chafe, meaning that the handle could start to wear away over time. EVA foam – One advantage that foam has other the other two types of solutions is that is it very light which is why it can be seen as a great option on the higher end trekking poles. They are also able to wick away moisture too in order for you to remain comfortable and with a firm grip. It performs very well in terms of comfort and the handles are usually ergonomically shaped very well in order to give you a great grip of it. EVA isn’t as expensive as cork though which is another reason why it is an attractive product. In terms of overall comfort, cork is generally seen as the winner with handles but EVA foam is a close second and the best option if your primary concern is weight. Foam ranks the worst in durability though, as it is a lot more delicate than the other two options. Shock absorption can come in the form of two different aspects as you can have the natural absorption of natural materials or you are able to get the mechanical absorption which will be added to the bottom of the pole in order to cushion each step that little bit more. In terms as materials, as we have seen, this can come from carbon fiber which has a natural level of absorption in the material as it will flex ever so slightly once you have placed your weight down on to it. This little bit of help can go a long way and it is part of the reason that these types of poles are more expensive. Aluminum poles are a lot of rigid and don’t have any on this protection inbuilt within them. In terms of mechanical absorption, this comes in the form that it usually does and that is a spring which will be able to take a bit of the impact out of each stride. While this might seem like a great feature to have, some prefer the feel without it and there are some drawbacks too. 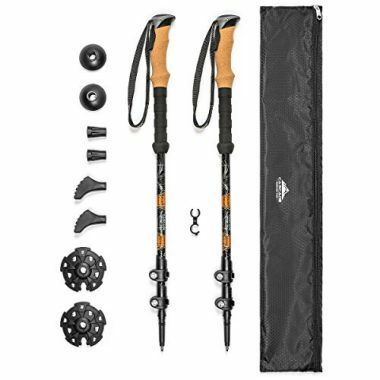 The added mechanism will add more weight to your trekking pole which isn’t ideal as the extra comfort from the absorption would be outweighed by the fatigue of lifting the poles. It is also a mechanical piece of engineering on a product which takes a lot of punishment and with products like this, sometimes it’s best to keep parts that can break to a minimum. When it comes to the length of your pole it often comes down to what type you are planning on getting as there are three main types of trekking pole out there. They all have their advantages and it’s important to take them into account when you are trying to get the perfect length of trekking pole for you. Telescopic – These are the most common types of pole on the market as they are very easy to adjust in order to get the perfect length for you. This will allow you to find the ideal balance on flat ground but it will also allow you to change the length when you are going up and downhill. The locking part of the system though is the biggest weakness which is why you would need to make sure that you are able to get a quality product and one which isn’t going to fail you. Some people prefer the feel and security of a fixed length pole. Foldable poles – When it comes portability then there is nothing which is going to be able to beat the foldable pole which will be able to fold down to a size which is much smaller than their telescopic counterparts. A problem here though is that these poles are more or less as a fixed length with only ever a small amount of adjustability, for that reason getting the right length is vital in ensuring that you have a pole which is going to be as comfortable as possible when you’re out there on a hike. Fixed – As you can imagine, a fixed pole doesn’t have any room for adjustment so you will be stuck with the length that it is. This means that you have to choose the right length exactly and you might end up frustrated if you find that your height is on the border of two different sizes. These poles are now the rarest option due to the fact that they are the least portable and also the advancement of the two other types which can now give a very strong and sturdy pole. If you are worried about getting the right length then it is a good idea to get an adjustable pole which will be able to give you the perfect fit. 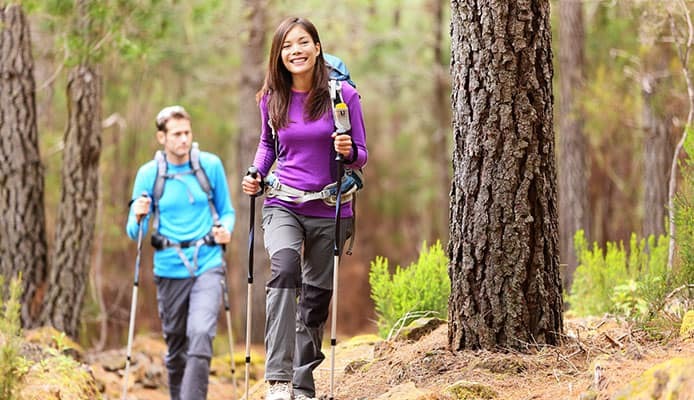 Weight is a key factor in any piece of hiking or backpacking equipment as with each stride you take, any surplus weight can take its toll and soon lead to discomfort or aches. Trekking poles are no different and you want to ensure that you are looking to get the lightest model which you can. These are effectively little weights that you are lifting up, potentially thousands of time in a single day. The whole point of these products is to take away strain from your lower legs but that is going to be pointless if you have arms that are going to be aching. For some this will be more of a problem than others, and for seasoned hikers who are used to using poles, they may be more focused about durability than anything else. In terms of materials carbon fiber is going to be the lightest and easiest to pick up and this would be your choice if weight is your number one priority. Aluminum poles can still be very light though and there are other factors to consider which means that you wouldn’t mind having some extra weight such as if they were foldable, had shock absorption or were going to be more durable. Weight is an important factor but you still need to take it in the context of everything else too. The type of trekking that you are going to be doing is also going to play a role in which type of pole is going to be the most suitable for your situation. As often is the case with hiking, you need to look at your situation and assess the features that are going to be the most important to you. If you are going to be up and down significant terrain then it’s likely that you would be much better with an adjustable pole as this is going to be able to get you up those hills and down them too. For each type of terrain that you are going to be on, you would be able to have the perfect length. It could be though that you are the type who only ever wants to head out on simple trails on day hikes in good weather. In this scenario, there would be nothing wrong with getting a fixed pole which will be able to help you along your journey but you will have the high level of durability and wear. There are those who don’t like to use trekking poles but appreciate that when going over difficult terrain they can be very useful. 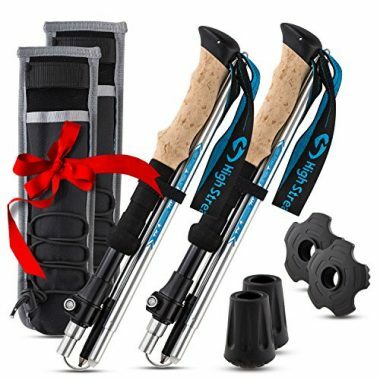 In this situation it would probably be the best solution to have a foldable trekking pole which you are able to put away in your backpack until it comes to using it. Of course these aren’t the only situation that you are ever going to encounter and therefore it’s always important to know the purpose of your trek and what your needs are going to be. That way you will always be able to use the pole that it was designed for and ensure that you have a comfortable trip. Not only can trekking poles help you in your stride and take pressure off your joints but they will also be able to help you when you are in difficult terrain too. This is especially relevant when the weather has been poor and the ground become looser and harder to hike though. Strong hiking poles are especially important in this situation as they will enable you to get through it without completely tiring out your legs. Even if you don’t like using trekking poles, this is where having foldable ones stored away can be useful as they could help you get through terrain after bad weather. You should always be mindful though of the environment that you are in and the round that you are traveling. 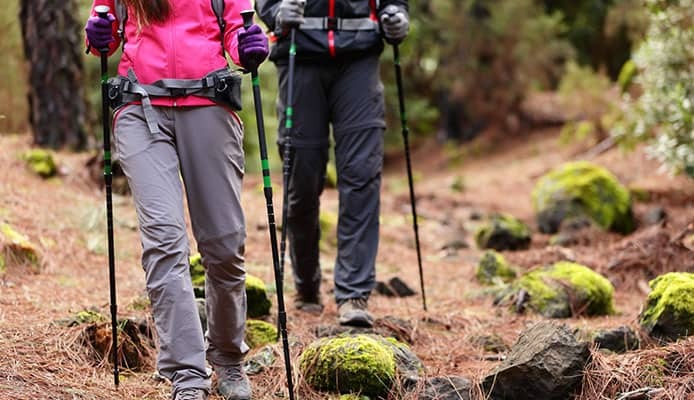 Hiking poles can cause damage to paths over time and you want to be conscious of the impact that your poles are having and make sure that you don’t leave too much damage. Telescopic trekking poles are starting to dominate the market and it’s important to make sure that when you get one that it has a locking system which is going to be high quality. Not only is it important that this is done as easily as possible, but you also want to make sure that it is able to lock securely into place and that it will be durable enough to cope with the strain. On most models now they feature a lever system which is very simple to you as all you have to do is pop open the level, move the pole inside the shaft and then lock the lever back in place. While this is a simple method of locking, it can vary in quality from one product to the next and you want to ensure that you are buying a great pole. With the lever type of models, it’s also good to look at the lever and see how easy it is going to be to use. It could well be the case that you will be trying to adjust your trekking pole when it is cold and you might have gloves on, in this situation you want the lever to be as easy as possible. With foldable models you these tend to not have a locking mechanism as they will work in much the same way as a tent pole where they will secure themselves with tight joints and then will stay locked in due to the weight that is applied to them as they are pushed down. Straps are an underrated but vital part of a trekking pole and all of them should come with straps. These will help you to reposition your hand without worrying about losing them and they will also ensure that you don’t lose your pole should the grip slip out of your hand or any other accident occurs. One useful quality to have is a strap that is adjustable as if you have small hands then it’s possible that the strap becomes fairly useless if it’s not only to effectively wrap around your wrist. An adjustable strap will make sure that your hand stays tight to it so that it will be able to do its job. It also matters what type of material the strap is made from too and more abrasive and hard wearing materials might chafe your hand over time and lead to soreness. Having a breathable fabric will also help to stop you from sweating with can especially be a problem on hotter days. While having a strap is important, it’s also vital that you use it properly which a lot of people don’t. The correct method is to enter your hand from below the strap as this will allow it to be securely placed around your wrist with the two connecting straps running under your palm. In terms of tips there are two important considerations as there is the tip itself and then also there are things that can be added to the tip in order to help you get through specific types of ground. In terms of the actual tip, this needs to be very hard to deal with the constant contact but also provide you with a high level of traction. Due to that, these tips are generally made out of one of two materials and they are either hardened steel or tungsten carbide. Tungsten carbide is seen as the better solution and will be found on higher end poles but steel will still be able to do a highly effective job. Some products will come with tip covers which are good for storing away in your pack but also will be able to provide protection to the tip if you are walking over asphalt. There is also the added features that some products come with in the form of baskets which is the name for attachments which will be on the end of the pole. These baskets which will vary greatly in size are very useful for a number of different types of ground. The smaller ones are great when there is a lot of debris on the ground such as branches but the larger ones are designed for much more difficult terrain when you want a large surface area in order to push yourself in the snow. These can be a very useful feature and can make life a lot easier in difficult conditions. These products are designed to take a lot of punishment and therefore they need to be as durable as possible. As we have just discussed there, the place which is going to take the most punishment is the tip and you want to make sure that you are going to get a quality product which isn’t going to wear down very quickly. After that, the materials also play an important role when it comes to durability but both of the main shaft materials have a high degree of durability but this is the one area where it is preferable to get an aluminum pole as they are going to be able to last you for longer than a carbon fiber pole would. In terms of durability it’s also important to look at the overall construction too as on adjustable and foldable models, there will be more weak points which can fail if you are going to be getting a cheaper model. A way to combat this would be to get a fixed pole but this doesn’t give the advantages in other areas that the other two options have. Another key area for durability would be the grip as a cork handle would most likely give you the highest level of durability as both rubber and foam cause a lot more chafing and are more liable to wearing away over time. The most durable model then would be a fixed aluminum pole with a cork handle but you also have to assess all the other features to find your perfect model. One area which a fixed pole does fall down is the packed size that it has. The packed size really is a feature which is hugely dependent on the type of activity that you will be doing. For example, if you’re hiking style of choice is the drive to a beautiful spot and walk around for a few hours then packed size will be of minimal concern. For others it is more important and a fixed pole obviously has no other backed size other than the size that it comes in as it will have no adjustments built into it. A telescopic pole will be able to be withdrawn to its smallest size which would most likely be just about 25 inches long which can still be too long for some. The foldable models naturally excel in this area and are generally about to fold down to a size of around 15 inches which is a lot easier to manage and will be able to be stored away in a backpack and used by you whenever you feel like it’s going to be convenient. Q: What Are Hiking Poles And What Are The Benefits Of Using Them? A: While the hiking poles that we have reviewed here are made of specialist materials with precise engineering, the hiking pole at its basic level is a lot simpler. It’s a tool that you place in your hand which you will use to use off from the ground in order to aid your movement. This can be as simple as a branch or as complicated as these brilliant carbon fiber models. When you are hiking with poles you are placing them down on the floor and, in effect, hiking four limbs as your arms will be taking some of the weight off your legs. This means that your legs will get less tired and you will be able to hike for longer as your arms are taking some of the burden. They will also help you to be more stable and can help you get into your stride when you are hiking. They are a tool which you will find has a surprising level of benefits when you use them for the first time. Q: How Should I Store My Hiking Poles When I Am Not Using Them? A: Hiking poles are designed for a lot of heavy punishment and therefore you don’t have to worry too much about caring your them when not in use but there are a few steps that you should take in order for them to be safe and secure. Firstly it is best to cover the tips, not only to stop them from getting damaged but also after prolonged use the metal can have scratches which can become quite sharp. Also they are not designed for side impacts and it’s best to store them on their sides just in case you knock into them when accidents occur. It’s also best to make sure that you are storing them when they are clean and dry as you don’t want anything growing on there or affecting its ability, this is especially important for adjustable poles where water can creep in. Q: How Should I Clean My Hiking Poles? A: Hiking poles are relatively easy to clean as a damp cloth should be all that you need in order to restore them back to their former glory. It’s important to not use any damaging chemicals as that could damage the grip and also take away some of the finish. You would also be careful to not get any water inside of the hiking poles and it is best that running water is only applied to the bottom of the pole, below its lowest joint. Once cleaned then it’s best to let it fully dry before storing it in case there is any internal residue. Q: How To Make My Hiking Poles Last Longer? A: Whilst they are a durable product, you still want to take care of them to help them last even longer. One of the ways that you can do that is by protecting your tip. If you are walking over hard ground such as asphalt, it’s best to cover your tip or not use it at all. Trekking can be made a lot easier once you have a pole to help you on your journey. It is going to be able to take the weight of your feet and also give you better balance and stability over rough terrain. Other great benefits are their ability to help you get into your rhythm while walking. In order to get the best hiking pole for you though there is clearly a lot to consider and you have to take it all into account before you make your choice. The first decision is the type of pole that you are going to buy as you can either get a fixed pole, a telescopic one or a foldable pole. Once you have decided that then there are the other important features to worry about such as the material that the shaft is made from as well as the material on the handle too. After that you will want to make sure that you have the right shock absorption, length, straps and extra features you need. A lot of this depends on the type of hiking that you will be doing and it’s important to bear that in mind while making your decision. Once you have done that then you will be able to know exactly what type of trekking pole you need and which of these features are going to be the most important to you. This guide should contain all the information that you need to make the right choice. Once you have then you will be able the head out on your hike and be able to enjoy it in more comfort than ever before.